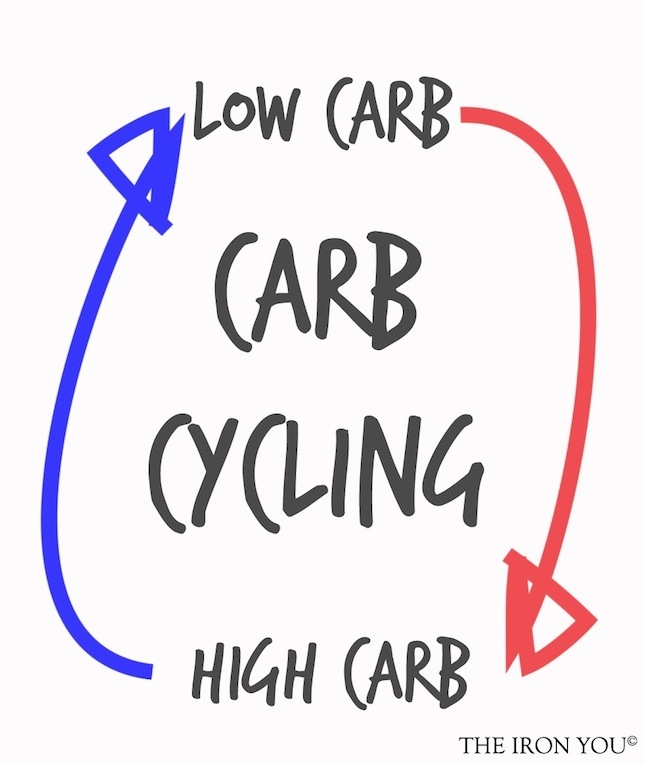 Carb Cycling – What’s it all about? Following the same low carb plan day in and day out is a strategy that often leads to a plateau in fat loss and leads to low levels of, metabolic rate, thyroid function, energy levels and hormone function (especially testosterone). All of the above are essential for optimal fat loss and overall health; you can’t simply follow the same system and hope for results, you must have a strategy. This is where carb cycling comes in. Carb cycling is a planned alteration of your carbohydrate intake designed to stop you hitting a plateau along your fat loss journey. It also helps to maintain a more optimal metabolic rate, and allows you to continue to perform at your very best. Carb cycling is an individual system where you have to see how your body responds to a given protocol. Some people find they do very well having a carb load once every 2 weeks, some every week, some find it works well to have 3 days low carb followed by 1 day high carb. My first suggestion is to have a higher carb meal once per week and to then check your body fat levels the day after to see how it has affected you. Fat loss is an individual approach and what works for you may not work for someone else. Let’s have a look at the protocols. This is for someone who has a lot of discipline and can stay consistent with their diet throughout the week until their planned large re feeding meal say on a Saturday. It is very important that you stay strict in the week and resist temptation if you use this protocol. An example of a re feed meal may be by adding a sweet potato and a large dessert like apple pie and organic ice cream to your standard lean protein and vegetable meal. This is a planned re feed protocol that occurs every 3 or 4 days whilst you are still following a lower carb plan. In some cases, low carbohydrate systems can affect your mental focus and concentration, not everyone can handle low carbs for too long (even a full week). This is where a planned boost of carbs every few days can help. So in this case you would still remain on a lower carb plan of between 30 – 40 grams of carbs per day (for the average 55kg female) for three days and then on the fourth, you could have three pieces of fruit throughout the day, a post workout shake and a post workout carb meal with a sweet potato. Once again, check how your body reacts the day after and adjust the re feeds if you have gained body fat. If you feel like you’re putting fat on, you usually are. When it comes to fat loss, you’re going to be following a programme of reduced calorie intake throughout. But you can continue to shock your body by mixing up your macronutrient intake through the week. This is different to the frequent and moderate re feeds, as you’re not going to bump your calories up here. You’d stick to your daily calorie level, just switch between higher carb, medium protein and lower fat, to lower carb, medium protein and higher fat. The best way to do this is to pick your highest volume or more demanding training sessions as your higher carb days, and the rest as your lower carbs days. This will still give you plenty of energy to really push those hard leg days ahead of you. This works very effectively, but must be used by people who are committed to preparing their food and rotating menus throughout the week. I know it seems it seems a silly point, but the calories I’ve used are an example and not specific to each of you. When it comes to fat loss, especially to someone who wants to get to single digit figures, I always know where their calories are. To give you an extra tip, the next step in this process could be to cycle your calories and carbs at the same time. So you would follow the same process, but drop your calories by 350 for one or two days, and then add 350 calories to the day after. This is another great way to shock your body, whilst still remaining on a weekly calorie intake the will support body composition change. Those people that are looking to gain lean muscle mass always come to a standstill when they notice fat gain at a lot quicker rate than muscle gain. In this case following a lower carb, high protein, high fat diet during the week can still work in your favour. You create a plan around a structured large re feed meal which can provide you with the extra calories and anabolic nutrients required to build muscle, whilst still remaining lean. So say on a Sunday you load up on 15 – 20% more calories from carbs than you would normally have. So a 3000 calorie weekly plan would mean loading up to 3450 – 3600 and then dropping back down again the day after. If you find this plan works well for you and you are still gaining lean mass, add 2 high carb meals in on your re feed day and see how that works. In some cases two planned re feed days work very well and you will continue to develop muscle mass whilst still remaining lean. Remember to assess your body composition regularly. * Remember that not every strategy works well for everyone, try one for a few weeks and then change it if it’s not working. * Add your re-feeds in as your post workout meal and not before. * Don’t try to attempt carb cycling if you’ve not got the basic habits and essential skills of fat loss nailed down. * Give carb cycling a go and let me know how you get on.